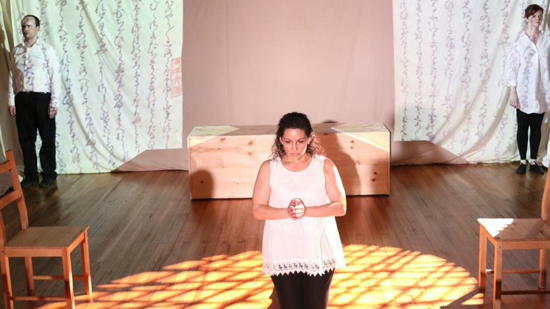 Cohesion Theatre Company ends their inaugural season with Anna Moench’s The Pillow Book, in partnership with Strand Theatre Company and directed by Jonas David Grey. Through snippets of thoughts and memories, the Theatre Companies paint a solid, enlightening picture of modern life and the hopes and dreams that most often accompany it. …I certainly enjoyed the ride. The action on stage does come across as shreds of information, thoughts, memories and personality traits of many characters.Because of the solid direction and the three-person cast, each brief glance of every character in broadly different circumstances is enough to convey their individual personalities throughout this very non-linear play. Joseph Coracle plays John, the only male in the play, but he seems to play at least two different partners in two different relationships (or are they the same person during different times and phases of a relationship?). He does it well and with obvious empathy. We find his character(s) in the Serengeti, in an office cubical and at the top of a frozen mountain, each time interacting with Deb (Michele Massa) and Deborah (Rebecca Ellis). In the beginning, Michele Massa’s Deb conveys the hope and the dream-like love possible in intimate relationships. Her joy flows over the stage from her interactions with John, but when questions of pregnancy and motherhood begin to cloud the story, sadness and concern begin. Massa does a wonderful job of slowly spreading these new feelings of turmoil through her character, holding my interest and focus throughout. Rebecca Ellis’s Deborah is sharp and provided many of the laughs. Her interactions with John in the African wild animal park were particularly humorous, but Ellis’s underlining sadness and desperation was just enough to convey that Deborah wasn’t all that she seemed. Ellis’s interaction with the TSA officer at the airport is outstanding. The simple set has white fabric backdrops that form a horseshoe around the stage and has photographs (designed by Jonas David Grey) pertaining to the scene projected on them. A trunk and two chairs round out the set on stage, but the white backdrops also provide shadow profiles of objects behind them, which adds to the layers of visible, invisible and hazy parts of each character and scene. The Pillow Book doesn’t follow the classic beginning, middle and ending structure of storytelling, but that’s okay because of its skillful treatment by the cast and crew. I might not have understood everything that was going on, even during the final resolution of the plot threads, but I certainly enjoyed the ride. Advisory: Adult language and adult situations. The Pillow Book runs through July 12, 2015 at Cohesion Theatre Company in conjunction with Strand Theatre at Church on the Square in Canton, 1025 S.Potomac Street in Baltimore, MD. For tickets click here.